Prof. Enrique Zuazua is a Distinguished Professor of Ikerbasque (Basque Foundation for Science) and the Founding Scientific Director at the Basque Center for Applied Mathematics (BCAM), which he pushed into life in 2008. He is also Professor in leave of Applied Mathematics at the Universidad Autónoma de Madrid (UAM) and a Humboldt Awardee at the University of Erlangen-Nuremberg (FAU) as well. He was invited by the PDE-group of our Faculty in Karlsruhe to join our work on Wave Phenomena for some days in May 2015. In our conversation he admits that waves have been holding his interest since his work as a PhD student in Paris at the Université Pierre-et-Marie-Curie in the world famous group of Jacques-Louis Lions. Indeed, waves are everywhere. They are visible in everything which vibrates and are an integral part of life itself. In our work as mathematician very often the task is to influence waves and vibrating structures like houses or antennae such that they remain stable. This leads to control problems like feedback control for elastic materials. In these problems it is unavoidable to always have a look at the whole process. 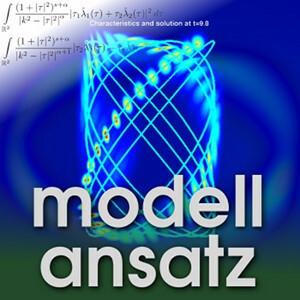 It starts with modelling the problem into equations, analysing these equations (existence, uniqueness and regularity of solutions and well-posedness of the problem), finding the right numerical schemes and validating the results against the process which has been modelled. Very often there is a large gap between the control in the discrete process and the numerical approximation of the model equations and some of these differences are explainable in the framework of the theory for hyperbolic partial differential equations and not down to numerical or calculation errors. In the study of Prof. Zuazua the interaction between the numerical grid and the propagation of waves of different frequencies leads to very intuitive results which also provide clear guidelines what to do about the so-called spurious wave phenomena produced by high frequencies, an example of which is shown in this podcast episode image. This is an inherent property of that sort of equations which are able to model the many variants of waves which exist. They are rich but also difficult to handle. This difficulty is visible in the number of results on existence, uniqueness and regularity which is tiny compared to elliptic and parabolic equations but also in the difficulty to find the right numerical schemes for them. On the other hand they have the big advantage that they are best suited for finding effective methods in massively parallel computers. Also there is a strong connection to so-called Inverse Problems on the theoretical side and through applications where the measurement of waves is used to find oil and water in the ground, e.g (see, e.g. our Podcast Modell004 on Oil Exploration). Prof. Zuazua has a lot of experience in working together with engineers. His first joint project was shape optimization for airfoils. The geometric form and the waves around it interact in a lot of ways and on different levels. Also water management has a lot of interesting and open questions on which he is working with colleagues in Zaragoza. At the moment there is a strong collaboration with the group of Prof. Leugering in Erlangen which is invested in a Transregio research initiative on gasnets which is a fascinating topic ranging from our everyday expectations to have a reliable water and gas supply at home to the latest mathematical research on control. Of course, in working with engineers there is always a certain delay (in both directions) since the culture and the results and questions have to be translated and formulated in a relevant form between engineers and mathematicians. In dealing with theses questions there are two main risks: Firstly, one finds wrong results which are obviously wrong and secondly wrong results which look right but are wrong nonetheless. Here it is the crucial role of mathematicians to have the right framework to find these errors. Prof. Zuazua is a proud Basque. Of the 2.5 Mill. members of the basque people most are living in Spain with a minority status of their culture and language. But since the end of the Franco era this has been translated into special efforts to push culture and education in the region. In less than 40 years this transformed the society immensely and led to modern universities, relevant science and culture which grew out of "nothing". Now Spain and the Basque country have strong bonds to the part of Europe on the other side of the Pyrenees and especially with industry and research in Germany. The Basque university has several campuses and teaches 40.000 students. This success could be a good example how to extend our education system and provide possibilities for young people which is so much a part of our culture in Europe across the boundaries of our continent.